Last Sunday Jesse and I taught the Rainbow K-5th graders a song called, Peace before us (By David Haas). I told the children that I would love it if they could help teach the congregation this song someday. It sounds like there are plans in the works to make this happen. Hooray! This song has been helpful for me today, January 16, as I sit in the Marriott Downtown, together with 20 other Mennonite leaders from all over the country. We are here in order to begin planning worship for the Mennonite Church USA convention to be held in Kansas City in July of 2015. I have never planned worship with so many people and for so many people. It’s hard work! Many ideas, opinions, and expectations have been expressed. This picture perhaps says it best. 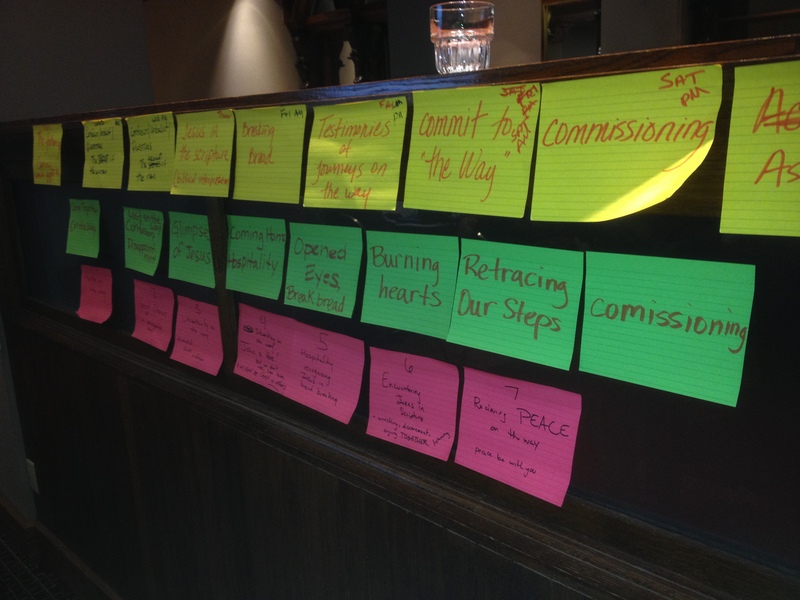 (I’ve never planned worship with post-it notes but I think I might have to start!) As the day wore on and as my patience wore thin at times, I found myself singing “Peace before us.” And then, wouldn’t you know, we all sang it! I whipped out my camera and caught a video of Jeremey Kempf leading one verse of this song. Jeremy will be the song leader for KC2015. Parents, please make sure you show this to your kid(s). I hope this song and its message sticks!